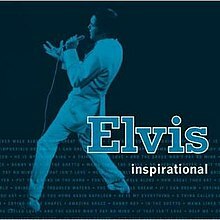 Elvis Inspirational, RCA's 2006 compilation, is part of a set of six theme-based compilations that also includes Elvis Rock, Elvis Country, Elvis Movies, Elvis Live and Elvis R&B and is made up of pop and gospel recordings seen to be inspirational, including Paul Simon's "Bridge Over Troubled Water," Neil Diamond's "And the Grass Won't Pay No Mind," Mac Davis' "In the Ghetto," "Danny Boy," and "The Impossible Dream". ^ Elvis Inspirational at AllMusic. Retrieved 2017-03-28. This page was last edited on 27 June 2018, at 22:46 (UTC).